Ankara Travel – Girne – Learn something about the company who will be pleased to advise you on all your travel arrangements. To read more click here . Christmas came early to Bookseller in Alsancak – Getting ready for Christmas then perhaps you should see what is available at the Bookseller. To read more click here. Olive Press Flat Green Bowling – Newsletter No .2 – Read the latest news letter and put those special dates in your diary. To read more click here. Phoenix Line Dance Club On Tour in Turkey – Read and hear more of the Phoenix Line Dance Club trip to Turkey. – To read more click here. Royal British Legion, Kyrenia Branch – Remembrance Sunday Lunch at The Ship Inn– To read and hear more of this splendid event click here . TRNC – That was the week that was – 10th November– Read more of the recent events in Cyprus. To read more click here. Is there any one from the Wilts Regiment who was there ? I was in the S. Company stationed in Agirda and Aisa Ambrosia camps, with frequent visits to B. Co. in Kyrenia Castle. Yes I recognised the photo of the camp, and remembering wakeing up every morning to the mountain at back of the camp. On my visit (with my wife ) some 30 + years later.I filmed the very concrete base that I lived on, for over 1 year, and pointed out the very spot where my iron bed was situated. Many memories flooded back. Like where the latrines were, which was then only a hole in the ground,with a wooden roof over, so a wide berth was given to that area, as the remains of it must still be there, and we did not wish to fall in it after all these years I filmed much of the area that was left of the camp, but a lot of it is now being built on, so by now none of it will be left.. Ha!! to be that young again as we were then. Thank you for your comment, very interesting. I have written to you separately by email. 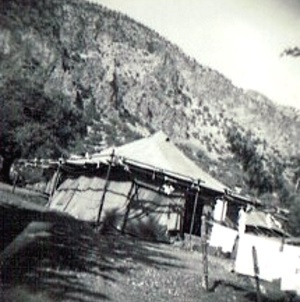 Do you recognise this photo of Agirda Camp?